Travel in West Virginia is unique. It’s not about the museums at the next destination. 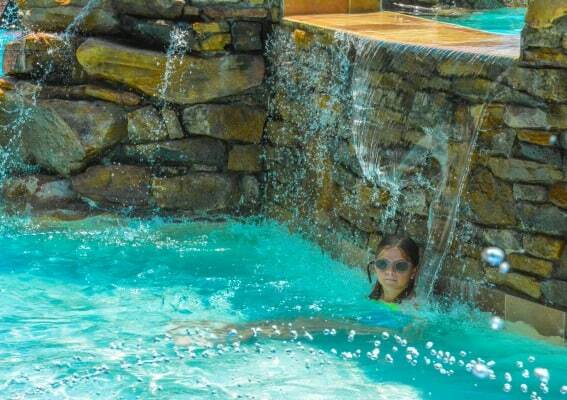 It’s not about how many water slides are at a resort. Exploring West Virginia is a journey: from the point that the car tires leave the interstate pavement until they cross out of the Mountain State once again. West Virginia’s famous country roads are a destination. The whitewater adventures, steam train excursions, and hikes are simply a part of that journey. On a West Virginia road trip, be sure to go hiking in West Virginia. Looking for the best road trips from DC for your family? A scenic West Virginia road trip to the New River Gorge, West Virginia has lots of fun for the kids! A West Virginia road trip amongst the Appalachian Mountains along West Virginia’s country roads is an adventure in itself. Rarely does cell phone service reach many of these remote valleys perfect for hiking in West Virginia. Drivers in West Virginia must pay attention to directional signs and highway numbers. It’s good to have a map and a plan taking a West Virginia Road trip to the New River Gorge. 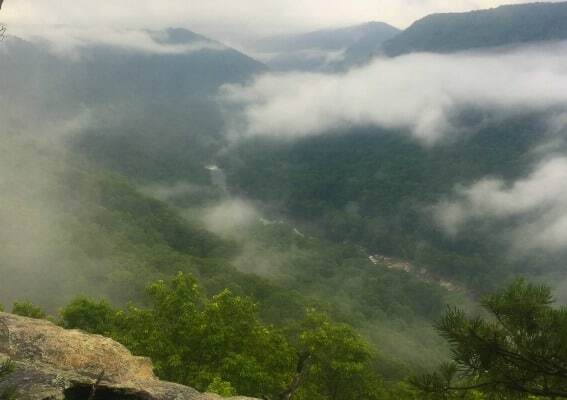 Families will want to stop and take in the view along their journey through West Virginia, but where? It would take a lifetime to find all of the mountaintop views and refreshing swimming holes in West Virginia. Working with some state tourism experts, I’ve discovered some of the most impressive natural sites in West Virginia. This road trip begins and ends in the nation’s Capital Region. However, this road trip from DC would work for families coming from all over the Mid-Atlantic. Harpers Ferry sits at the confluence of the Potomac River and the Shenandoah River in West Virginia, but within sight of both Maryland and Virginia. Since our founding fathers visited in the 1780s, this site has been recognized as both a strategic location and scenic area. Thomas Jefferson declared Harpers Ferry to be “perhaps one of the most stupendous scenes in nature,” and George Washington later recommended the area for a new federal armory. Today the Appalachian Trail runs through Harper’s Ferry and the historic town is preserved as Harpers Ferry National Historical Park. 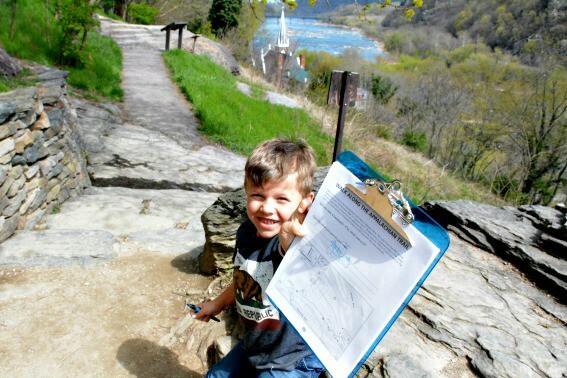 In a short two to three-hour visit at Harpers Ferry National Historical Park families can walk across the old rail bridge connecting West Virginia and Maryland, learn a bit about the history of Harpers Ferry by completing the junior ranger program, or walk up to Jefferson’s Rock to admire the view. Alternatively, if you have an entire day in Harpers Ferry you should check out all the outdoor adventures offered by River Riders. They are one of a few local outfitters that offer guided whitewater rafting trips down the Shenandoah and Potomac Rivers. 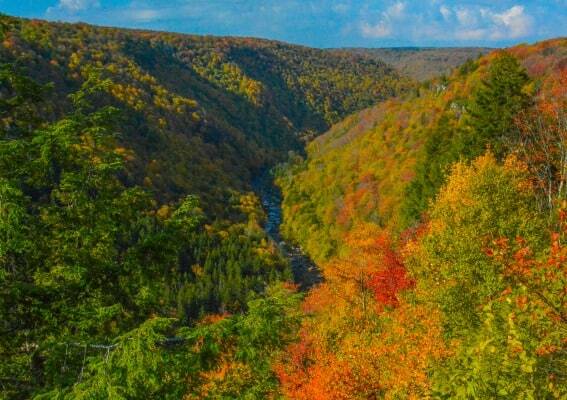 It is a two and a half hour drive west along US-48 from Harper’s Ferry National Historical Park to Blackwater Falls State Park. There is a campground and a lodge available at the state park itself; alternatively, families can continue another hour via WV-32 and US-33 to the town of Elkins where there are more hotel options. Upon arrival at Blackwater Falls State Park, it’s impossible to miss the Trading Post and trail access to Blackwater Falls. It’s a 10-20 minute walk via stairs down to the photo-op at the bottom of the falls. Yes, on weekends this is a popular place, but these falls are worth the stop in any season. 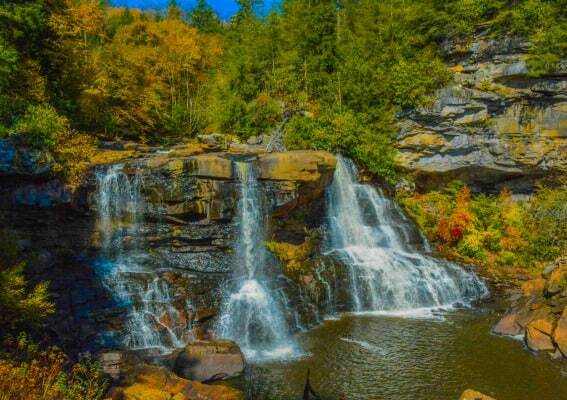 There’s more than just a waterfall at Blackwater Falls State Park! The Blackwater Canyon that stretches out beneath the falls into the mountains of West Virginia is almost as spectacular as Blackwater Falls themselves. In spring, the canyon viewpoints are highlighted by blooming purple rhododendrons. In fall, trees of brilliantly colored yellow, orange, and red leaves paint the valley an ever-changing palate of vibrant color. There are plenty of viewpoints within view of parking lots; however, the most impressive view is from Lindy Point, assessable via a short 1/3 mile walk. 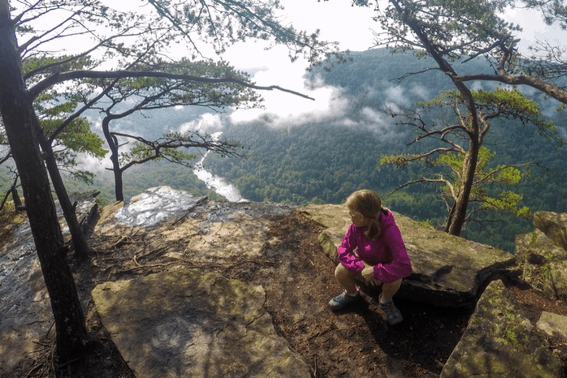 Lindy Point is one of our favorite trails for hiking in West Virginia with kids. Pocahontas County may be one of the least populated in West Virginia. 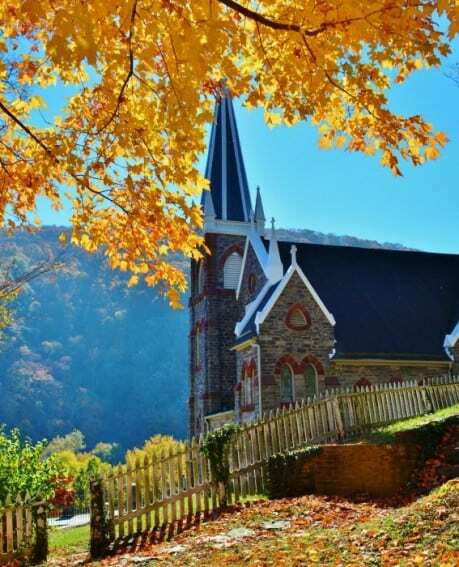 It one of the most rural places in the eastern United States; yet it is an essential stop for hiking in West Virginia on any West Virginia road trip. 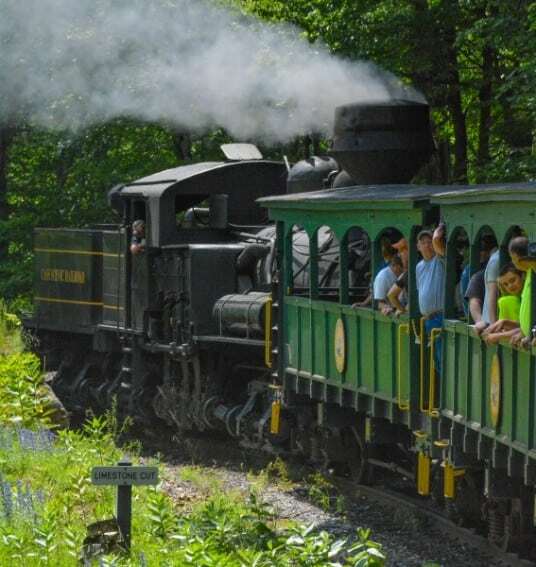 It boasts two of the state’s most unique and kid-friendly tourist attractions: the Green Bank Observatory and the Cass Scenic Railroad. If you don’t mind a few bumps on a dirt road, be on the lookout for the Gaudineer Knob turn-off on the left-hand side as you make the 90 minute drive from Elkins to Green Bank on WV-92. About 50 minutes down the road you’ll see the dirt road heading up to top of the mountain. Based on pictures, I thought we’d simply find a viewpoint up at the top. However, this piece of the Monongahela State Forest was set aside to protect virgin red spruce trees. We discovered quite an interesting forest up there. It’s a great place to go hiking in West Virginia with kids. As my children frolicked through the forest jumping off boulders and dancing among the trees, I’m not sure if we actually spotted the spruces that were set aside for protection or not. Yet, as we explored in the moments before sundown these trees reaching towards the sky and mossy undergrowth carpeting the forest floor looked as if it were a scene out of fairy tale. Calling all future scientists! 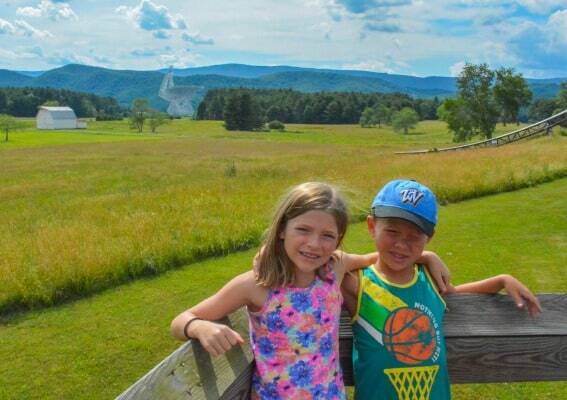 A tour of the Green Bank Observatory is an opportunity to learn all about the world’s largest fully steerable radio telescope from an actual astronomer. Tours aboard a special bus into RFI-restricted Zone (no cell phones or electronic equipment allowed) at the base of the Green Bank Telescope are generally held on the hour from 9AM-6PM most days throughout the summer months. Little scientists are welcome to participate in the tour, but my seven and eight-year-old had a lot more fun playing at the science center, which has several high quality, hands-on exhibits, after our tour. This is a great pit-stop on any West Virginia road trip. Step back in history from the state of the art radio telescope to a scenic steam train ride that ascends a nearby mountain. The railroad at Cass dates back over a hundred years to when the site was a prosperous lumber mill founded by Joseph K Cass of the West Virginia Pulp & Paper Co. Today the forest is again thick with trees. Only the ruins of the mill beside the Greenbrier River remind visitors of the heyday of the industrial age. In a unique set of switchbacks, the Cass Scenic Railroad spends about 45 minutes climbing up the mountain to Whitaker Station where there is amazing view, some old equipment, and a concession stand. Photo by: Melissa MooreCass Scenic Railroad State Park is only about a ten minute drive from Snowshoe Mountain Resort, a beautiful place to vacation in its own right. Or, families can continue their West Virginia road trip on scenic WV-39. 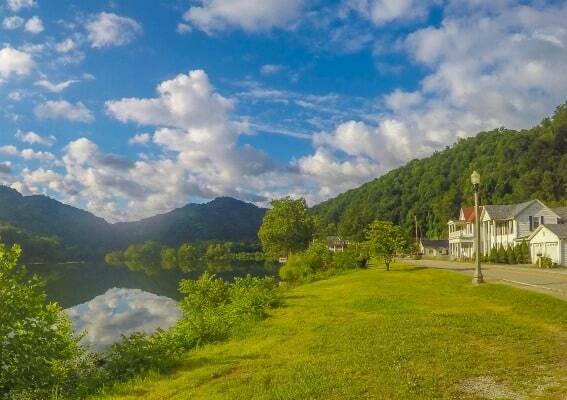 The drive from Cass Scenic Railroad to the New River Gorge, West Virginia is less than three hours. The most scenic part of this drive is along the Highland Scenic Highway through the Monongahela National Forest and Cranberry Glades Botanical Area. The Cranberry Glades area is known for its bogs that feature flora and fauna unique to area. 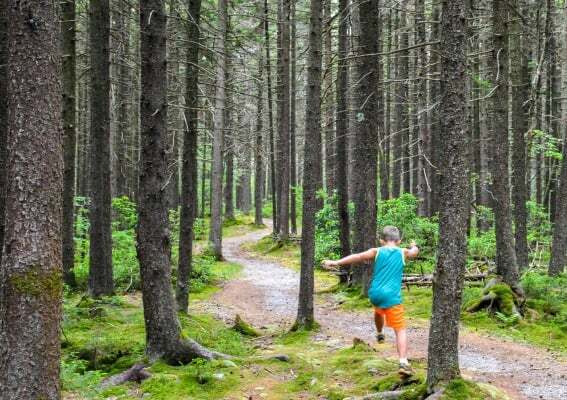 For those with time to stop, the Cranberry Mountain Nature Center can provide information on the boardwalk trails through the bogs and the hike to Falls of Hills Creek just a few more miles down the highway. Some of the best hiking in West Virginia can be found along the Highland Scenic Highway. Also, along the way, as WV-39 comes to US-19, is the beautiful Summersville Lake, a favorite among local West Virginians, and the Gauley River National Recreation area. The New River Gorge National River is truly West Virginia’s premier outdoor adventure destination with outfitters that can take families whitewater rafting on the New River, kayaking out to waterfalls, rock climbing along the New River Gorge, horseback riding through the scenic mountains, or zip lining in the tree tops. The opportunities are seemingly endless. If exploring on your own is more your family’s pace or budget, rangers at the Canyon Rim National Park Visitor Center, located right at the base of the iconic New River Gorge Bridge, are happy to assist families in finding the perfect day trip exploring the historic towns around the gorge. 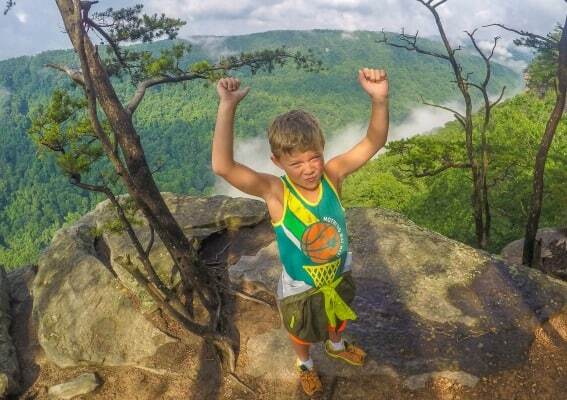 The New River Gorge has some of the best kid-friendly hiking in West Virginia. Sadly, we only had about a day and a half to spend in the region on our visit this July. That’s nowhere near enough time! So, we spent a day at Adventures on the Gorge and then a morning hiking along the gorge. We are already looking forward to a return trip. Families with kids at least 10-12 years old will find several days worth of adventures on a visit to the New River Gorge, West Virginia. 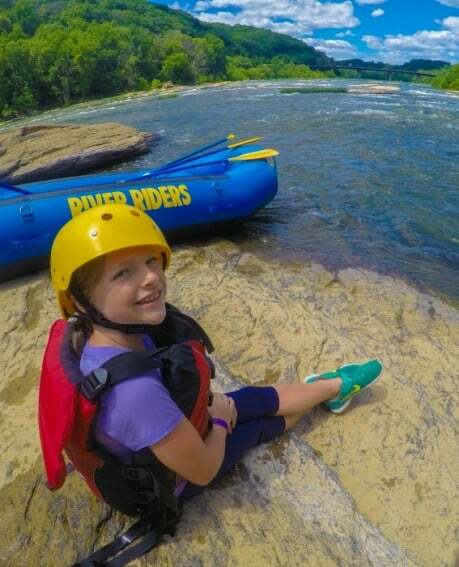 Adventures on the Gorge has something for everyone in the family from a playground and zero entry pool for tots to some of the most intense white water rafting available in the eastern states for teens and adults on the Gauley River. Whitewater options begin at age six on the Upper New River featuring Class I-III rapids. 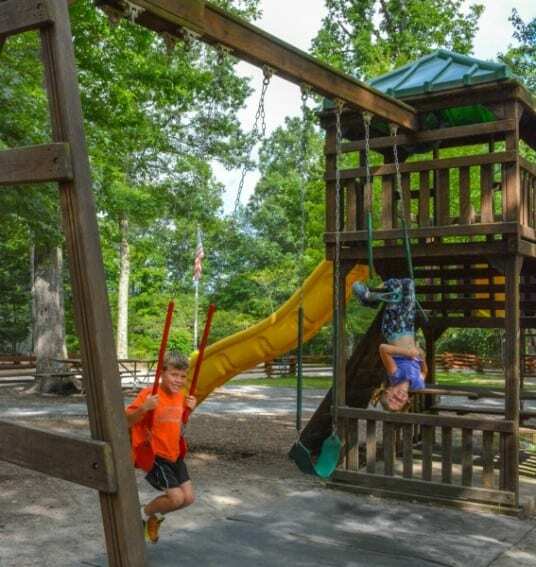 Six-year-olds can also climb at the TimberTrek Aerial Adventure Course. Children ages eight and up have even more options available to them including rock climbing, fishing, and kayaking adventures on Summersville Lake. 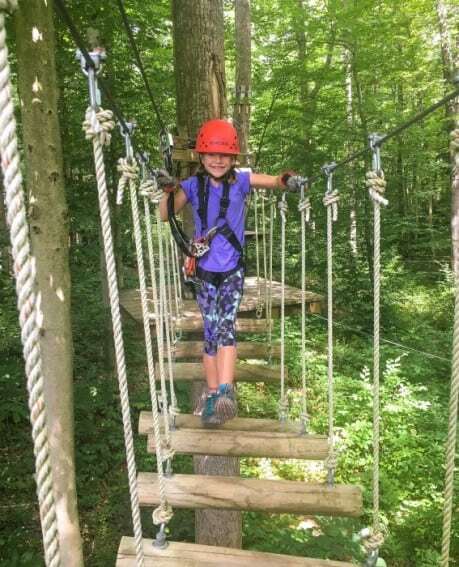 With my children, I enjoyed a more leisurely day at Adventures on the Gorge on our West Virginia road trip: climbing on TimberTrek in the morning followed by eating lunch at Chetty’s Pub and lounging by the Canyon Falls Swimming Pool in the afternoon. My son was seemingly born to climb. He was scaling playground equipment well before his first birthday. Often he is frustrated by the age limits at aerial adventure parks wishing that he could climb more challenging courses. Adventure on the Gorge’s TimberTrek, designed for ages six and up, kept him satisfied. The course is the most interesting that we’ve ever experienced for kids ages 6-7, and we’ve experienced many of the best courses in the Mid-Atlantic states. There is an extra measure of agility required beyond what we’ve experienced at other courses. So, if you’ve got a young adventure seeker on your hands, this is a course worth the drive. With adventure seemingly around every bend in the New River, it can be hard to take a break when visiting this area. However, you’ll have no trouble making some time for poolside relaxation after one look at the enticing Canyon Falls Swimming Pool at Adventures on the Gorge. This pool certainly gets my vote as one of the most beautiful in the eastern United States. It has rocky ledges and waterfalls all within view of the iconic New River Gorge Bridge. The zero entry splash pad is perfect for the little ones. There is also a snack bar serving drinks for adults that just need an afternoon off from all the excitement. We sure worked up an appetite while climbing at TimberTrek! 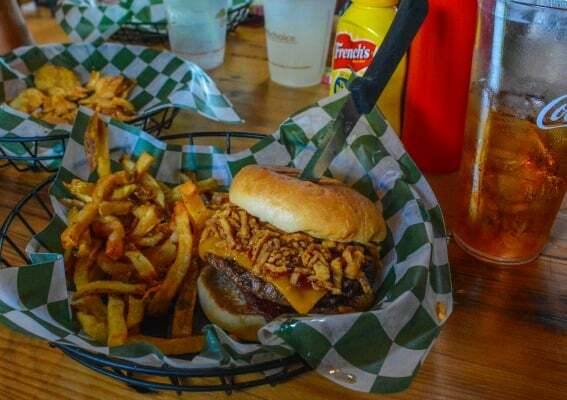 As soon as we finished climbing, we headed right over to Chetty’s Pub and enjoyed some cheese burgers and fries. (Yes! Those are fried onions on my burger. I totally earned that for keeping up with my kids at TimberTrek.) The food at Chetty’s is filling — perfect after a day of adventure. 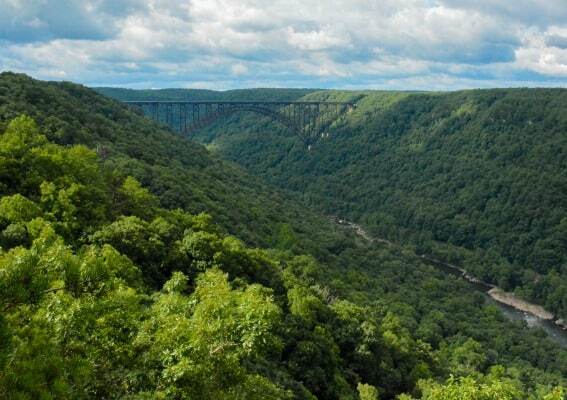 In addition to guided tours and restaurants, Adventures on the Gorge also offers a wide variety of accommodations from luxury cabins overlooking the New River Gorge, West Virginia to tent camping sites and practically everything in between. 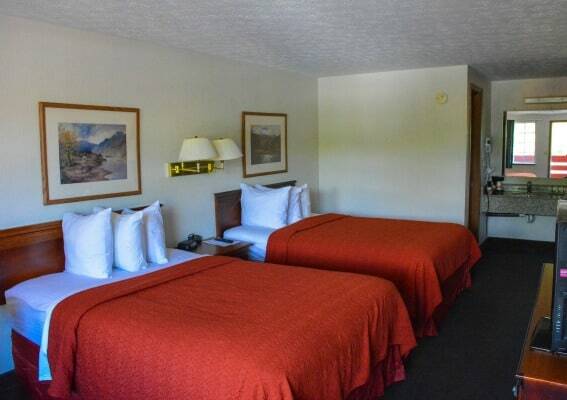 If you’re looking for a simple motel for an overnight stay rather than camping, renting a cabin, or staying at an outdoorsy resort like Adventures on the Gorge, the budget-friendly New River Gorge Quality Inn will meet your needs. It’s a great option if you’re just passing through the New River Gorge area on West Virginia road trip. It’s a fairly standard roadside motel that offers complimentary breakfast, an outdoor pool, corn-hole boards, and a picnic area. As much as my kids and enjoy thrilling zip lines and the adrenaline rush of whitewater rafting, some of my favorite memories are getting off the beaten path a bit to go hiking in West Virginia. As I was mapping our route out of the New River Gorge, West Virginia, I realized that we hadn’t really taken the time to explore the area’s natural beauty. After just a bit of research on the National Park Service website, I chose to hike the Endless Wall Trail during our final hours in the the area. So, we spent just under three hours hiking in West Virginia through the blooming rhododendrons and along rocky ledges watching as the mist cleared from the gorge right before our eyes. It was magical. It’s a long five and a half hour drive back to the Washington DC Metro area from Fayetteville. While I love driving West Virginia’s country roads, they get a bit monotonous after a few hours. Seneca Rocks is a curious rock formation rising from West Virginia’s forested Appalachian Mountains. It is just under a three-hour drive from the New River Gorge, West Virginia via US-19, I-79, US-48, and US-33. Families can choose to enjoy a picnic lunch in the shadow of Seneca Rocks. 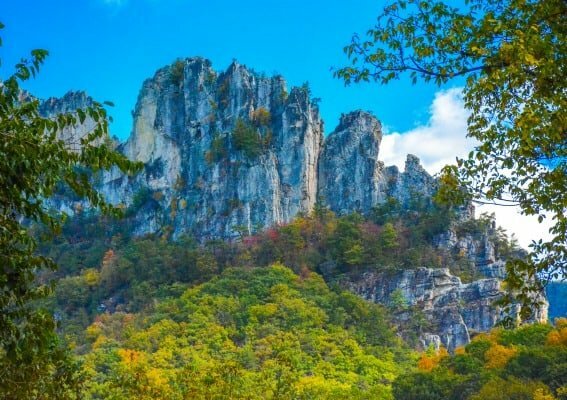 Seneca Rocks is also one of the most popular places for hiking in West Virginia. There is a ranger station at the base of the rocks that provides information on hiking in West Virginia. This is the ideal pit-stop on your journey back to DC. From Seneca Rocks, WV-28, and WV-42 take you back to US-48 which joins up with US-81 in Virginia’s Shenandoah Valley. If you haven’t spent enough time in the mountains, US-81 is just miles from both Shenandoah National Park and the Blue Ridge Parkway in the Blue Ridge Mountains. 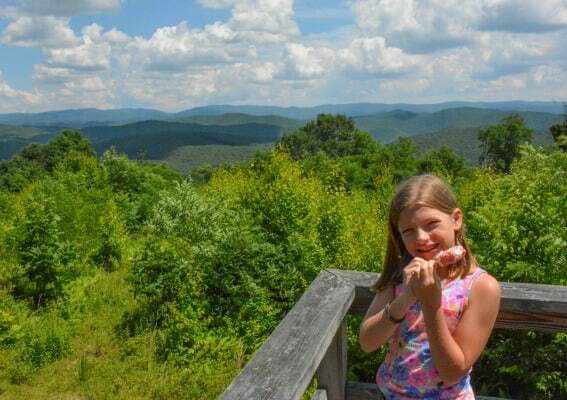 Families can easily extend their Appalachian road trip in Virginia and North Carolina. Photos by Melissa Moore unless otherwise credited. Disclosure: The author and her family were hosted by the New River Gorge CVB, Adventures on the Gorge, River Riders, the Green Bank Observatory Science Center, and Mountrail Adventures for the purpose of this review. All opinions are her own. From recommended routes to keeping boredom at bay while logging hours on the road, explore our ultimate road trip guide for families.